Bloggers often try to make money out of their blogs. Some are successful, few are. The reason is that most bloggers trying to make money from their blogs are attempting to cash in directly – selling things “off the page”. As any competent advertiser will tell you, few people actually buy “off the page”. In other words, few people respond to an advert and rush out and buy the product. For instance, newspapers and TV channels are stuffed with advertisements for the latest sofas and beds. Yet have they mad you rush out and buy new furniture? Unlikely. What they do is simply raise awareness – they do not “sell”. Focusing a blog on trying to sell is going in the wrong direction. However, blogs can sell – but it is a more subtle sell than you might imagine. Indeed, new research suggests that blogging is very good at selling traditional printed items like books and newspapers. For example, regional newspapers in the UK have seen a rise in sales if they have first published stories in their online blogs. Who would have thought that people would buy a printed item of something they have already read online? 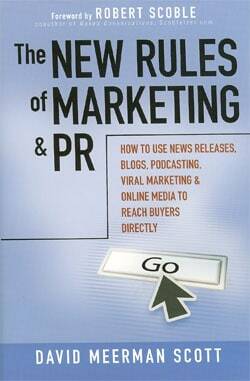 Similarly, “The New Rules of Marketing and PR” is an excellent book that was largely first a blog. Yet it is selling significant numbers and you can find it in many bookshops “business bestseller” lists. Not bad for something that has already been debated and written in depth online by the author. So, why is it that people are prepared to pay for something that they have already read online? Partly it’s about “ownership” – the blog is the author’s the book is “ours”. We like to possess things and having the book – even if we have read the blog is an important psychological step for us. This means there is an opportunity for online writers and bloggers to sell their material which people have already read. Your blog can make money if you publish it again as a book. Another reason for being able to sell printed versions of your blog is the fact that people have become interested in what you say and would like to take a more leisurely read of it – perhaps on the beach, or on the train. Reading from a screen is physically more demanding so is less relaxing. Hence there will always be a demand for printed material – and as a result you can make money from that. So, if your business has a blog consider all the ways you can turn it into printed materials that people will buy – books, magazines, tips-booklets – there are several options. Doing so, however, will mean your blog will make money – not from “off the page” sales, but from physical products people see in bricks and mortar shops.